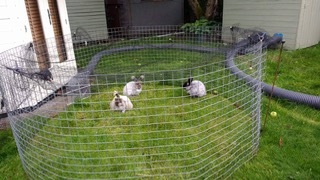 As I am not interested in breeding, I have all my rabbits neutered. 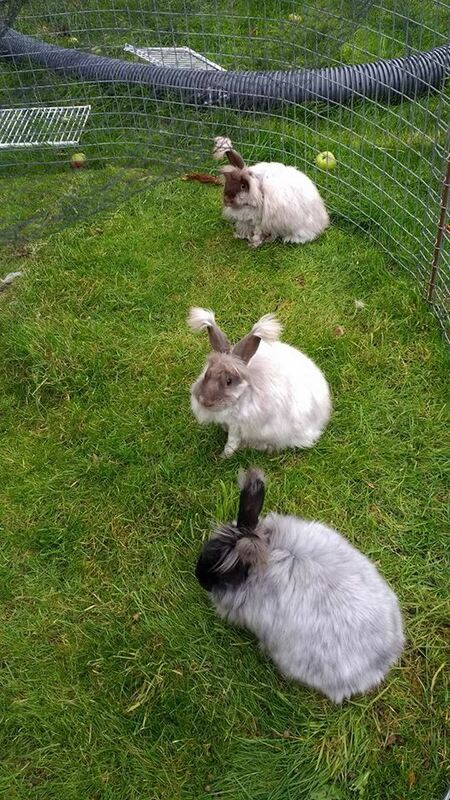 The groups consist of one group of three Angora rabbits, a pair of rescue rabbits and a single rescue rabbit who is partially sighted. Most of my rabbits were neutered while young, except for two who were four at the time, and I have had no problems at all with the process. Rabbit anaesthesia is now much improved and the younger rabbits have been active (often too active) within a day of the operation. My vet does not suture but the wounds heal with no problems because they close up naturally. It is my belief that because there are no stitches reminding the rabbit it has a wound, the bunny forgets it is there and ignores it. So no neck collars or “the cone of shame” have ever been needed to stop the inquisitive teeth. Why do I neuter my rabbit? Having lost one to uterine cancer, and another to suspected cancer, it makes sense, and the operation is relatively cheap to prevent that risk. 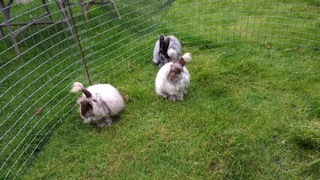 But the other great advantage is that the rabbits can live together in groups or pairs. Now I make no claims to be an expert on bonding rabbits, and if you read up about the process you will get different views from one person to another. There are three main factors to take into consideration. Rabbits have PERSONALITIES, rabbits are TERRITORIAL and rabbits have HORMONES. So putting Snowy into Blacky’s territory is never going to work. Much is down to the personality of the rabbit and its background and experiences. However the rewards are tremendous, watching my lovely pair of rescue rabbits (Stan and Lily) together, who spend nearly all their time curled up together despite a massive age and size difference. They love to groom each other and try to eat the same dandelion leaf at the same time! Disadvantages with this pair are that Stan eats a lot faster, so they have to be fed their pellets separately to ensure Lily gets hers. It is therefore necessary to monitor the dietary intake and weight more carefully. There is also the worry of how Stan will manage when Lily dies as this bond is so close. I have read that bonded rabbits need time with the dead bunny so the partner can absorb the information, but have not had to do this yet. However they are both on their second partners, so with an easy going nature like Stanley, I hope that he will find another love of his life. Bonded couples will often mount each other. This can pose a problem as Stan is bigger than Lily and she is an “old Lady” so she has tunnels and tubes to get out of his way. The Angoras are a buck and two does. This particular trio was easy to bond. Duncan was a year or two older and previously neutered. (Note that the male remains fertile for six weeks after neutering!) The two does were young, and on this occasion everyone got on so well that they just moved in together. This worked well because at that age the females were not at all hormonal or territorial. They went in the run together, and since then three fluffy Angoras are a happy trio. As soon as they were old enough ( vets seem to vary on this one, I think it depends on the latest research as to the approved age) the two does were neutered at the same time, then confined to the hutch in the rabbit house so Duncan kept in contact with them. 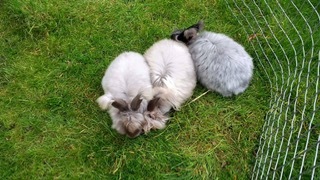 All three went to the vets together so no one smelt different, and I kept the does in the hutch for two days. However they are used to having a shed to run about in, and after two days were so boisterous they were let out of the hutch. In the wild there is a system of hierarchy and I would have expected this to show in this trio, but they are all pretty equal with maybe one doe a bit more retiring. However they sit together, in pairs and all variations with no problems. Because they are all similar happy calm rabbits no one personality tries to dominate and all is well. That is not to say that they do not run and chase, especially when in the run, which is a biggish 10ft diameter run, with a “Runaround” tubing attached to allow them to escape if anything spooks them. So plenty of opportunity to run, binky and chase each other, especially when it is a nice sunny day. They just love it. I never tire of watching the rabbit habit of jumping over its friends! No one hops round another bunny, they just hop over each other! The three rabbits live together in a shed. This means that they have a communal area and, when the weather is bad, they can still get plenty of exercise without having to go out in a run and get wet and bedraggled. Not every bond I have tried has worked successfully; originally I tried to bond the two males but made the mistake of allowing them in close proximity before Duncan was neutered. He took great delight in spraying Stanley through the wire mesh. Stan took offence and was never going to make friends with that fluffy upstart Duncan. That said, they did get together by devious means and lived together for several months, but although there was no fighting, it was not a happy home. So a second shed was commandeered and Stanley went to live with a doe. 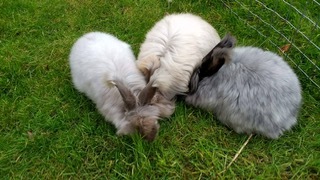 To start the bonding process, some people keep rabbits adjacent so they get to know each other before trying them together, always on neutral territory. Rabbits are very territorial. Some people put them together for the first time in a small area, again neutral territory, and then gradually increase the size of the area. What works for some will not work for others. It is all down to personality and how the rabbit has lived its life up to now. To neutralise an area, white vinegar can be used, though a lot of people use a room which doesn’t normally house a rabbit, and set up a pen. Why is it so difficult when rabbits live together in the wild? Well, wild rabbits have a hierarchy from birth and every rabbit knows its place. If an individual wants to challenge the status quo it will have to fight. That is what we don’t want. However cute rabbits look, rabbit fights are nasty, can cause serious injury, and are to be avoided. If you are still wondering why it can be difficult to bond rabbits then just look at the dating agencies and apps available to humans, and the number of marriages that end in divorce. 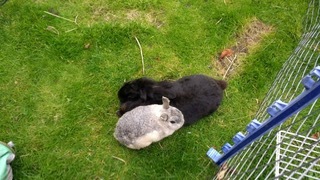 But a happy bonded pair of rabbits is a joy to have, though like a happy marriage it might need some work. Again as with humans, a doe and bucks will bond, some does will bond and occasionally a pair of bucks will bond, but NEVER by just putting just one rabbit in with another. The chances of success will increase no end if they are both neutered. The observant will notice that I have one single rabbit. He lives in our conservatory because he has very poor sight. At present I have no other rabbit I think he would bond with, and I have no wish to upset the status quo with the others! Posted 13/12/2017 by LH & filed under Angora Welfare.